If today's practice race was anything to go by, Nico Poons' Charisma will be the boat to watch at this week's Audi RC44 Porto Cervo Cup, starting tomorrow on the magnificent waters off Sardinia's Costa Smeralda. Sailing in a warm 17 knot northwesterly, the 12 RC44 crews today made three trial starts before launching into a practice race. This was unofficially won by the Monaco-based yacht, Charisma leading into the finish, but Poons deliberately not crossing the line. "I guess some of the crew are a little bit superstitious about it for the rest of the week," he explained of the long held yacht racing belief that winning a practice race or prologue typically spells bad luck come the main event. Charisma's performance today continued her form from the RC44 Valletta Cup, which she comfortably claimed, earning Poons and his crew, that features Emirates Team New Zealand tactician Ray Davies, the RC44 championship leader's 'golden wheels'. As Poons proudly stated: "It was fine having the golden wheels today, absolutely fine." And the RC44 victory symbol he plans to hang on to this week. "The goal is to win of course, to keep the golden wheels! But there's good competition in the fleet, so I'll have to be alert and on my toes." In fact a feature of the RC44 fleet this season is how the competition has further increased. "There are about eight boats here which can win the regatta," believes Cameron Appleton, tactician on Chris Bake's Team Aqua, which has won the RC44 Championship five times. Here in Porto Cervo they have three time Farr 40 World Champion Jim Richardson standing in for Chris Bake on the helm. "Having Jim on board for the last couple of days is really fun," continues Appleton. "I have not sailed with him before, but I have known him and sailing against him for a long time. I have a lot of respect for what he has accomplished as an owner and as a sailor. 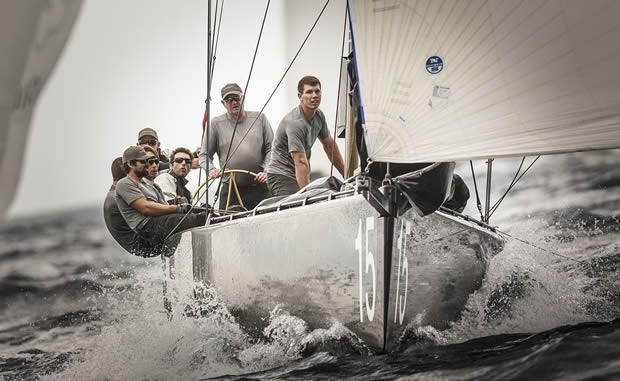 We have a team that is stand-out in this class and he comes from a team that has been stand-out in the Farr 40 class, so it is good to get those coming together." Team Nika finished runner-up to Charisma in Malta in March and skipper Vladimir Prosikhin is looking forward to racing here in Porto Cervo. "I have raced here before - it is one of the most beautiful places and one of the best marinas. The service here is tremendous and for the first time the owners are accommodated here in the club so you can see your boat from your balcony." Still racing as tactician on board Team Nika is Dean Barker, who since Malta has changed America's Cup teams, leaving Emirates Team New Zealand to become skipper and CEO of SoftBank Team Japan. "It is our second regatta together," says Prosikhin. "He is a great sailor and a great man, but his Kiwi is a bit challenging to understand!" Racing gets underway at 1200 local time tomorrow with the usual day of match racing – a continuation of the rolling RC44 Match Racing Championship – before fleet racing resumes on Thursday.